Received March 2, 2018; Revised March 21, 2018; Accepted March 22, 2018.; Published online April 12, 2018. Vertebrate organ development is accompanied by demarcation of tissue compartments, which grow coordinately with their neighbors. Hence, perturbing the coordinative growth of neighboring tissue compartments frequently results in organ malformation. The growth of tissue compartments is regulated by multiple intercellular and intracellular signaling pathways, including the Hippo signaling pathway that limits the growth of various organs. In the optic neuroepithelial continuum, which is partitioned into the retina, retinal pigment epithelium (RPE) and ciliary margin (CM) during eye development, the Hippo signaling activity operates differentially, as it does in many tissues. In this review, we summarize recent studies that have explored the relationship between the Hippo signaling pathway and growth of optic neuroepithelial compartments. We will focus particularly on the roles of a tumor suppressor, neurofibromin 2 (NF2), whose expression is not only dependent on compartment-specific transcription factors, but is also subject to regulation by a Hippo-Yap feedback signaling circuit. Development of the organs and tissues that make up multicellular organism is mediated by a series of compartmentalizations from unspecified germ layers of the post-gastrula embryo. During the divergent development that gives rise distinct tissues with defined size and shape from a uniform germ layer continuum, each compartment maintains a unique growth rate relative to its neighboring compartments (Stanger, 2008). The growth of individual tissue compartments is mainly related to the proliferation of the cells that comprise that compartment, whereas intercellular communication mediated by various morphogens and growth factors is responsible for coordination of growth between neighboring tissue compartments. Therefore, both alterations in intrinsic growth rate within a compartment and perturbations in growth coordination between neighboring compartments cause tissue hypertrophy and hypotrophy, resulting in various developmental defects. Vertebrate eyes have been employed to study intercellular and intracellular signaling pathways that specify the fates of optic compartments by inducing compartment-specific transcription factors and coordinate growth of neighboring compartments by regulating cell proliferation (Chow and Lang, 2001; Graw, 2010; Kim and Kim, 2012). The primordial eye field in the anterior neural plate is specified immediately after gastrulation to form the optic vesicle (OV), a neuroepithelial evagination of the ventral-lateral diencephalic area. The OV then invaginates to form a double-layered optic cup (OC), the inner and outer layers of which develop into the neural retina and the retinal pigment epithelium (RPE), respectively. At the peripheral region of the OC, which forms the border between the retina and RPE, the ciliary margin (CM) is specified and develops further into the ciliary body (CB) and iris in the mature eye (Beebe, 1986; Fig. 1). Each optic neuroepithelial compartment has discrete growth and proliferation features (Chow and Lang, 2001; Graw, 2010; Kim and Kim, 2012). The retina has greater proliferative potential than the other two compartments by virtue of the presence of retinal progenitor cells (RPCs), which are capable of dividing repeatedly and generating retinal neurons and Müller glia on distinct developmental schedules. In contrast, the RPE consists of post-mitotic epithelial cells that establish a monolayer structure that enwraps the retina (Fuhrmann et al., 2014). Cells in the embryonic CM and post-natal CB maintain their proliferative potential even as cells in the retina stop proliferating, albeit at a lower rate than retinal cells (Napier and Kidson, 2005; Fig. 2). Proliferating cells in the CM can also be specified to RPCs in the peripheral retina, although the retinal stem cell property of these cells in the mammalian eye remains a matter of debate (Belanger et al., 2017; Cicero et al., 2009; Marcucci et al., 2016; Ohta et al., 2008; Tropepe et al., 2000). Therefore, not only the CB and iris, which arise from the CM domain, but also the retina, fail to grow to normal size when CM cell proliferation is impaired. Defects in CM/CB cell proliferation, therefore, often manifest as microphthalmia. Multiple signaling pathways that influence the specification and growth of the CM and CB have been identified (Fig. 2). Wnt signaling activity, as determined by Tcf7l1-dependent reporter gene expression, is concentrated in the CM area, particularly in the outer CM layer (Fuhrmann et al., 2009; Liu et al., 2003). Inactivation of Wnt signaling by deletion of β-catenin (βCtn) results in transformation of the CM and RPE into the retina as a result of failure to specify and/or maintain the CM and RPE (Fujimura et al., 2009; Westenskow et al., 2009). Conversely, constitutive activation of Wnt-βCtn signaling leads to expansion of the CM domain into retinal territory (Cho and Cepko, 2006; Liu et al., 2007). These observations therefore suggest that active Wnt-βCtn signaling is necessary to maintain CM fate, whereas normal eye development requires that Wnt signaling be inhibited in central OC regions (i.e., the retina and RPE). In addition to Wnts, autocrine bone morphogenic factors (BMPs) are also necessary for development of the CB. Unlike Wnts, which maintain CM identity in the embryo, BMPs mainly act to induce CB folds in the post-natal eyes. Support for this, a haplodeficiency of Bmp4 or inactivation of BMP signaling by overexpression of the BMP antagonist, Noggin-1, in the lens significantly inhibits the growth of mouse CB (Chang et al., 2001; Zhao et al., 2002). BMP signals are not only delivered by Smad proteins in the ciliary epithelium (CE) comprising the CB, they also crosstalk with Notch signaling (Zhou et al., 2013). Among multiple Notch receptor and ligand isoforms, Notch2 is expressed in the outer CE layer, whereas its ligand Jagged-1 is expressed in the inner CE layer, enabling Notch signaling from inner to outer CB layers during post-natal CB growth (Zhou et al., 2013). Conversely, Notch1 activation in the inner CB layer by ligands in the outer CB layer might also possibly coordinate CB growth, given that RPE-to-RPC Notch signaling is known to act in the central OC (Ha et al., 2017). Sonic hedgehog (Shh) is secreted by retinal ganglion cells (RGCs), the first-born retinal neuron subtype, and can diffuse to act on CM cells, while it induces RPC proliferation in the retina (Wang et al., 2005). However, the mitogenic effects of Shh cannot reach the CM because Shh is captured and endocytosed by low-density lipoprotein-related protein 2 (Lrp2) in CM cells (Christ et al., 2015). 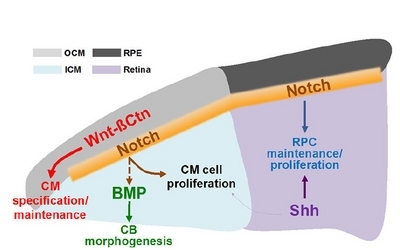 Collectively, these intercellular signaling pathways coordinately regulate the proliferation (positively by Wnt and Notch, but negatively by Lrp2) and morphogenesis (positively by BMP) of CM/CB during eye development. However, given the shared, but graded, characteristics of the retina, CM/CB and RPE in terms of proliferation, differentiation and stiffness, additional determinants that are commonly displayed, but to different degrees, in all compartments should be present to allow differentiation of these characteristics. However, given the shared characteristics of the retina, CM/CB and RPE, in terms of proliferation, differentiation and stiffness, additional determinants that are commonly displayed, but to different degrees, in all compartments should be present to allow differentiation of these characteristics. The Hippo signaling pathway was originally identified in Drosophila as a potent mechanism that regulates organ and tissue growth (Yu and Guan, 2013). The Hippo signaling pathway consists of a kinase cascade comprising the Ste20-like kinase Hippo (Hpo), the adaptor protein Salvador (Sav), and the NDR family kinase Warts (Wts) (Harvey et al., 2003; Tapon et al., 2002; Udan et al., 2003; Wu et al., 2003). The Hpo-Sav complex phosphorylates and activates Wts, which in turn phosphorylates the oncoprotein yorkie (Yki), thereby excluding it from the nucleus (Huang et al., 2005; Lai et al., 2005). Inactivation of Hippo pathway components or over-expression of Yki results in tissue hyperplasia, characterized by excessive cell proliferation and diminished apoptosis. Hippo pathway components are highly conserved from Drosophila to humans. The homologs of Hpo (mammalian STE20-like protein kinase 1/2, MST1/2), Sav (Salvador family WW domain-containing protein 1 [WW45]), Wts (large tumor suppressor 1/2 [LATS1/2]), and Yki (Yes-associated protein [YAP] and transcriptional coactivator with PDZ-binding motif [TAZ]) constitute an analogous pathway in mammals (Kanai et al., 2000; Lai et al., 2005; St John et al., 1999; Sudol, 1994; Tapon et al., 2002). Hippo signaling is activated by contact-dependent signals. Thus, many upstream regulators of Hippo signaling pathway, including Expanded (Ex), Merlin (Mer) and Kibra, are commonly involved in polarization and adhesion of the epithelium. In Drosophila, these cytoskeleton-interacting proteins are located at the cell cortex and provide a scaffold for Hippo signaling kinases. Ex proteins activate Hippo signaling through interactions with the transmembrane proteins Crumbs and Fat, which are crucial for maintaining apico-basal and planar cell polarity, respectively (Bennett and Harvey, 2006; Cho and Irvine, 2004; Grzeschik et al., 2010; Robinson et al., 2010). Scribble (SCRIB) binds to Fat and recruits and activates MST1/2 and LATS1/2 (Mohseni et al., 2014; Verghese et al., 2012). At adherens junctions (AJs) in the epithelium, the immunoglobulin domain-containing cell adhesion protein Echinoid (Ed) activates Hippo signaling by interacting with Sav (Yue et al., 2012), whereas cadherins recruit Mer and Kibra via α-catenin to activate Hippo pathway (Kim et al., 2011). Alternatively, protein tyrosine phosphatase non-receptor type 14 (PTPN14), angiomotin (AMOT) and α-catenin have been shown to sequester YAP/TAZ at cell junctions to activate Hippo signaling (Chan et al., 2011; Huang et al., 2013; Liu et al., 2013; Schlegelmilch et al., 2011). Neurofibromin 2 (NF2), also known as schwannomin, is a mammalian homolog of Drosophila Mer that is predominantly expressed in vertebrate nervous tissues (Li et al., 2012). Various NF2 mutants are associated with the human autosomal-dominant disorder, neurofibromatosis type-2, which is characterized by the occurrence of noncancerous tumors in the nervous system (Asthagiri et al., 2009). NF2 functions as a tumor suppressor by facilitating the contact-dependent inhibition of cell proliferation (Curto et al., 2007). NF2 is homologous to ERM (ezrin/radixin/moesin) family actin-binding proteins, and can serve as a linker between plasma membrane components and the actin cytoskeleton (Bretscher et al., 2002). NF2 has also been shown to integrate extracellular-to-intracellular signaling by interacting with various intracellular proteins (Curto and McClatchey, 2007). In particular, NF2 is known as a regulator of the Hippo signaling pathway. NF2 activates the Hippo signaling pathway at multiple levels. First, NF2 initiates Hippo signaling via MST kinases (Hamaratoglu et al., 2006). Specifically, NF2 recruits MST1/2 to form an MST–SAV complex, which phosphorylates LATS. Second, at AJs, NF2 activates LATS independently of MST by associating with α-catenin and AMOT, which recruits LATS kinases (Li et al., 2015). Last, NF2 inhibits the E3 ubiquitin ligase CRL4-DCAF1 to inhibit CRL4-DCAF1-mediated ubiquitination of LATS kinases (Li et al., 2010). YAP/TAZ (YAP and TAZ) is expressed in all optic neuroepithelial compartments; however, its importance varies according to tissue type. In zebrafish, germ-line knockout of yap/taz leads to RPE agenesis and coloboma (Miesfeld et al., 2015), whereas the expression of constitutively active yap(5SA) augments eye pigmentation (Asaoka et al., 2014). Deletion of Yap in mouse OV (Yapf/f;Rx-Cre mice) also results in trans-differentiation of the RPE into retina (Kim et al., 2016). However, the ectopic retina is unable to develop a normal morphology, because the loss or knockdown of Yap decreases the proliferation of RPCs and simultaneously enhances neuronal differentiation, resulting in precocious depletion of RPC population (Kim et al., 2016; Zhang et al., 2012). Ablation of Yap/Taz in mouse primordial RPE (Yapf/f;Tazf/f;TRP1-Cre mice) also leads to fate transition into a retina-like population (Moon et al., 2018). The severity of the phenotype varies depending on the remaining number of Yap/Taz alleles (Moon et al., unpublished). Deletion of Yap/Taz in the specified RPE (Yapf/f;Tazf/f;MART1-Cre mice) or the retina (Yapf/f;Tazf/f;Chx10-Cre mice), however, leads to hypoplasia of the cells without fate transition (Moon et al., 2018; Yapf/f;Tazf/f;Chx10-Cre mouse results are unpublished). Yap/Taz-deficient RPCs also exhibit aberrant differentiation (Moon et al., 2018), consistent with the observations in the Yap-deficient lens that show precocious differentiation of lens progenitor cells, disrupted lens epithelial cell polarity, and increased apoptosis (Song et al., 2014). Collectively, these observations indicate that Yap/Taz is necessary for the maintenance of progenitor populations in the retina and RPE that supports the growth of optic neuroepithelial compartments during development. In mouse eye development, Nf2 promoter activity is robust in the lens and RPE, but is weak in the retina (Akhmametyeva et al., 2006). Mice lacking the Nf2 gene specifically in the lens epithelium and embryonic neuroepithelium exhibit malformations in lens structure and the anterior segment of the eye, respectively (Wiley et al., 2010; Zhang et al., 2010). In agreement with these reports in mice, human neurofibromatosis type-2 patients acquire anterior ocular lesions, such as colobomatous microphthalmia and juvenile cataracts (McLaughlin et al., 2007; Mononen et al., 2007). These patients also suffer from hypertrophies in posterior parts of the eye, including the epiretinal membrane (Bosch et al., 2006a; Landau and Yaşargil, 1993; McLaughlin et al., 2007), as well as combined pigment epithelial and retinal hamartomas (CPERH) (Bosch et al., 2006a; Sivalingam et al., 1991), and optic nerve sheath meningiomas (Bosch et al., 2006a; 2006b). Recently, we reported that the NF2-Hippo pathway limits the growth capacity of the RPE and CM in the developing eye (Moon et al., 2018). Loss of Nf2 in the mouse optic neuroepithelium leads to microphthalmia and ocular lesions, defects similar to those found in human neurofibromatosis type-2 patients. These abnormal eye morphologies mostly result from overgrowth of the pigmented cell population in the uveal tract. Selective ablation of Nf2 in the embryonic CM/RPE population (Yapf/f;Tazf/f;TRP1-Cre mice) also results in expansion of those populations, indicating that NF2 restricts the proliferation of optic neuroepithelial derivatives. These ocular lesions are phenocopied by inactivation of Lats1/2 in the CM and RPE (Moon et al., 2018), implying that inactivation of the Hippo pathway mediates the defects in Nf2-cko mice. In support of this, Nf2-deficient CM and RPE show elevated nuclear localization of Yap/Taz proteins. Furthermore, heterozygous deletion of Yap and Taz in the Nf2-deficient CM and RPE significantly suppresses the hyperplasic phenotypes, suggesting that NF2 supports CM and RPE development by maintaining proper Hippo signaling activity in these populations (Moon et al., 2018). NF2 has been amply demonstrated to exert an anti-proliferative function in various progenitor populations and is known to mediate the Hippo pathway (Lavado et al., 2013; Serinagaoglu et al., 2015; Zhang et al., 2010). Thus, the differential expression of NF2 along the optic neuroepithelial continuum might generate the observed gradients of Hippo signaling activity and cell proliferation rate in the optic field. Interestingly, Nf2 is a target gene of the YAP-TEAD transcription activator complex (Moroishi et al., 2015) and Nf2 expression was significantly reduced in Yap/Taz-deficient mouse CM (Moon et al., 2018). This therefore establishes an NF2-Hippo-YAP/TAZ feedback circuit, especially in the CM where nuclear Yap is enriched and sustains growth in the post-natal mouse eye (Moon et al., 2018). In the other two optic neuroepithelial compartments—RPE and retina—the two compartment-specific transcription factors Mitf and Sox2 are suggested to control Nf2 expression. Mitf activates Nf2 transcription in the RPE by binding directly to its conserved target sequences in the Nf2 promoter; thus, NF2 expression is eliminated from the RPE of Mitfmi-vga9/mi-vga9 mice (Moon et al., 2018). Sox2 has been reported to bind to an upstream sequence of the human NF2 promoter to repress transcription of the NF2 gene in human osteocarcinoma cells (Basu-Roy et al., 2015). In accord with this, a Sox2 deficiency in the mouse retina was shown to result in the expansion of Nf2-positive CM cells into the retinal territory, indicating that Sox2 is necessary for suppressing the expression of Nf2 in RPCs (Moon et al., 2018). The ectopic CM population in the Sox2-deficient mouse retina was also shown to be positive for Yap/Taz, suggesting the alternative possibility that Sox2 blocks the expression of Nf2 indirectly by inhibiting Yap/Taz expression. The functions of YAP/TAZ in stem cell maintenance have been described in various experimental systems (Barry et al., 2013; Lian et al., 2010; Ohgushi et al., 2015). The mammalian CM has been shown to give rise to the cells in the peripheral retina and ciliary epithelial progeny in the CB and iris, at least during embryonic and perinatal periods of eye development (Belanger et al., 2017; Marcucci et al., 2016). Mouse CM cells express Yap/Taz at higher levels compared with the moderate Yap/Taz expression in early RPCs, suggesting that high Yap/Taz activity is required for maintaining the stemness and bipotency of CM progenitors and the antagonistic activity of the Hippo pathway toward them. In support of this, nascent RPCs derived from Nf2-deficient CM progenitors do not differentiate into neurons in the perinatal mouse retina, but simply expand themselves in association with persistent nuclear accumulation of Yap/Taz. However, the Nf2-deficient RPC population eventually ceases to accumulate and is depleted after post-nataly day 14 (Moon et al., unpublished data). These results are in agreement with research on frog CM stem cells (Cabochette et al., 2015). In the adult frog CM, Yap is specifically expressed in active neural stem cells within the retina. Furthermore, Yap loss-of-function or gain-of-function analyses suggest that Yap is essential for proper cell cycle progression, but is dispensable for stem cell maintenance (Fig. 3). Hippo signaling activity is tightly regulated during eye development such that dysregulation of Hippo signaling activity leads to severe ocular lesions owing to defects in the coordination of optic tissue growth. 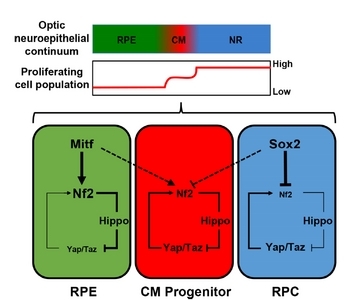 Recent studies have revealed that NF2, an upstream regulator of the Hippo signaling pathway, plays a crucial in eye development by differentiating the growth profile of the optic neuroepithelium, establishing the epithelial rigidity of the RPE/CM population, and maintaining proper Yap/Taz activity during the transition of CM-derived, nascent RPCs. Further research is required to reveal how the NF2-Hippo-Yap singling pathway is integrated with the multiple regulatory networks that control the eye development, including Wnt/β-catenin, BMP, and Notch pathways. Fig. 1. The neuroepithelium in mouse embryonic ventral diencephalon evaginates laterally to form the optic vesicle (OV), which then invaginates to form double-layered optic cup by E12.5. The proliferation rate of neuroepithelium in the OV is highest in the distal part, which is specified into primitive neural retina (pNR) (left). In the optic cup of mouse embryonic eye, the proliferation rate is displayed more diversely. Post-mitotic RPE cells form a monolayer sheet, while RPCs in the NR actively proliferate to produce retinal neurons (middle). The CM is specified in the border between the NR and RPE, and the cells in the CM proliferate moderately. The CM area further develops to form the ciliary body (CB) in the post-natal eye. The cells in the outer layer of CM/CB are pigmented, whereas those in the inner CM/CB layer are non-pigmented. The ciliary epithelium (CE) comprising the CB proliferates in the post-natal days, when majority cells in the NR become post-mitotic (right), and this drives the growth of the eye. Fig. 2. The CM is specified by Wnt-βCtn signaling in the edge of the double-layered OC of the midgestation mouse embryo. In late embryonic mouse eyes, RPCs receive Shh signals from RGCs, in addition to self-maintaining Notch signals, and sustain their proliferation at a high rate. Lrp2 expressed in CM cells prevents Shh from activating their proliferation, maintaining a lower proliferation rate in CM cells than in RPCs. In the post-natal mouse eye, the CM starts to form folds that develop into the CB with the help of autocrine BMPs, which are indirectly activated by Notch signals. Fig. 3. Nf2 expression is differentially regulated in the optic neuroepithelial continuum, which shows regional differentiation of proliferation rates. In the post-mitotic RPE, Mitf induces Nf2 expression by directly binding to upstream sequences of the Nf2 gene, triggering Hippo signaling and thereby excluding Yap/Taz from the nucleus. In proliferating RPCs, Sox2 inhibits the expression of Nf2 and, as a consequence, impedes Hippo signaling activity. In CM progenitors, which have the potential to give rise to RPCs and RPE in addition to developing locally into the CB and iris, Yap/Taz is localized to the nucleus, where it induces the expression of Nf2, thereby establishing the NF2-Hippo-Yap/Taz signaling cascade. This feedback regulatory circuit maintains a level of proliferation in CM cells intermediate between that of the RPE and RPCs. Akhmametyeva, EM, Mihaylova, MM, Luo, H, Kharzai, S, Welling, DB, and Chang, LS (2006). Regulation of the neurofibromatosis 2 gene promoter expression during embryonic development. Dev Dyn. 235, 2771-2785. Asaoka, Y, Hata, S, Namae, M, Furutani-Seiki, M, and Nishina, H (2014). The Hippo pathway controls a switch between retinal progenitor cell proliferation and photoreceptor cell differentiation in zebrafish. PLoS ONE. 9, e97365. Asthagiri, AR, Parry, DM, Butman, JA, Kim, HJ, Tsilou, ET, Zhuang, Z, and Lonser, RR (2009). Neurofibromatosis type 2. Lancet. 373, 1974-1986. Barry, ER, Morikawa, T, Butler, BL, Shrestha, K, de la Rosa, R, Yan, KS, Fuchs, CS, Magness, ST, Smits, R, and Ogino, S (2013). Restriction of intestinal stem cell expansion and the regenerative response by YAP. Nature. 493, 106-110. Basu-Roy, U, Bayin, NS, Rattanakorn, K, Han, E, Placantonakis, DG, Mansukhani, A, and Basilico, C (2015). Sox2 antagonizes the Hippo pathway to maintain stemness in cancer cells. Nat Comm. 6, 6411. Beebe, DC (1986). Development of the ciliary body: a brief review. Transact Ophthal Soc U K. 105, 123-130. Belanger, MC, Robert, B, and Cayouette, M (2017). Msx1-Positive Progenitors in the Retinal Ciliary Margin Give Rise to Both Neural and Non-neural Progenies in Mammals. Dev Cell. 40, 137-150. Bennett, FC, and Harvey, KF (2006). Fat cadherin modulates organ size in Drosophila via the Salvador/Warts/Hippo signaling pathway. Curr Biol. 16, 2101-2110. Bosch, MM, Boltshauser, E, Harpes, P, and Landau, K (2006a). Ophthalmologic findings and long-term course in patients with neurofibromatosis type 2. Am J Ophthal. 141, 1068-1077. Bosch, MM, Wichmann, WW, Boltshauser, E, and Landau, K (2006b). Optic nerve sheath meningiomas in patients with neurofibromatosis type 2. Arc Ophthal. 124, 379-385. Bretscher, A, Edwards, K, and Fehon, RG (2002). ERM proteins and merlin: integrators at the cell cortex. Nat Rev Mol Cell Biol. 3, 586-599. Cabochette, P, Vega-Lopez, G, Bitard, J, Parain, K, Chemouny, R, Masson, C, Borday, C, Hedderich, M, Henningfeld, KA, and Locker, M (2015). YAP controls retinal stem cell DNA replication timing and genomic stability. eLife. 4, e08488. Chan, SW, Lim, CJ, Chong, YF, Pobbati, AV, Huang, C, and Hong, W (2011). Hippo pathway-independent restriction of TAZ and YAP by angiomotin. J Biol Chem. 286, 7018-7026. Chang, B, Smith, RS, Peters, M, Savinova, OV, Hawes, NL, Zabaleta, A, Nusinowitz, S, Martin, JE, Davisson, ML, and Cepko, CL (2001). Haploinsufficient Bmp4 ocular phenotypes include anterior segment dysgenesis with elevated intraocular pressure. BMC Genet. 2, 18. Cho, E, and Irvine, KD (2004). Action of fat, four-jointed, dachsous and dachs in distal-to-proximal wing signaling. Development. 131, 4489-4500. Cho, SH, and Cepko, CL (2006). Wnt2b/beta-catenin-mediated canonical Wnt signaling determines the peripheral fates of the chick eye. Development. 133, 3167-3177. Chow, RL, and Lang, RA (2001). Early eye development in vertebrates. Ann Rev Cell Dev Biol. 17, 255-296. Christ, A, Christa, A, Klippert, J, Eule, JC, Bachmann, S, Wallace, VA, Hammes, A, and Willnow, TE (2015). LRP2 acts as SHH clearance receptor to protect the retinal margin from mitogenic stimuli. Dev Cell. 35, 36-48. Cicero, SA, Johnson, D, Reyntjens, S, Frase, S, Connell, S, Chow, LM, Baker, SJ, Sorrentino, BP, and Dyer, MA (2009). Cells previously identified as retinal stem cells are pigmented ciliary epithelial cells. Proc Natl Acad Sci U SA. 106, 6685-6690. Curto, M, Cole, BK, Lallemand, D, Liu, C-H, and McClatchey, AI (2007). Contact-dependent inhibition of EGFR signaling by Nf2/Merlin. J Cell Biol. 177, 893-903. Curto, M, and McClatchey, AI (2007). Nf2/Merlin: a coordinator of receptor signalling and intercellular contact. Br J Cancer. 98, 256-262. Fuhrmann, S, Riesenberg, AN, Mathiesen, AM, Brown, EC, Vetter, ML, and Brown, NL (2009). Characterization of a transient TCF/LEF-responsive progenitor population in the embryonic mouse retina. Invest Ophthal Vis Sci. 50, 432-440. Fuhrmann, S, Zou, C, and Levine, EM (2014). Retinal pigment epithelium development, plasticity, and tissue homeostasis. Exp Eye Res. 123, 141-150. Fujimura, N, Taketo, MM, Mori, M, Korinek, V, and Kozmik, Z (2009). Spatial and temporal regulation of Wnt/β-catenin signaling is essential for development of the retinal pigment epithelium. Dev Biol. 334, 31-45. Graw, J (2010). Eye development. Curr Top Dev Biol. 90, 343-386. Grzeschik, NA, Parsons, LM, Allott, ML, Harvey, KF, and Richardson, HE (2010). Lgl, aPKC, and Crumbs regulate the Salvador/Warts/Hippo pathway through two distinct mechanisms. Curr Biol. 20, 573-581. Ha, T, Moon, KH, Dai, L, Hatakeyama, J, Yoon, K, Park, HS, Kong, YY, Shimamura, K, and Kim, JW (2017). The Retinal Pigment Epithelium Is a Notch Signaling Niche in the Mouse Retina. Cell Rep. 19, 351-363. Hamaratoglu, F, Willecke, M, Kango-Singh, M, Nolo, R, Hyun, E, Tao, C, Jafar-Nejad, H, and Halder, G (2006). The tumour-suppressor genes NF2/Merlin and Expanded act through Hippo signalling to regulate cell proliferation and apoptosis. Nat Cell Biol. 8, 27-36. Harvey, KF, Pfleger, CM, and Hariharan, IK (2003). The Drosophila Mst ortholog, hippo, restricts growth and cell proliferation and promotes apoptosis. Cell. 114, 457-467. Huang, J, Wu, S, Barrera, J, Matthews, K, and Pan, D (2005). The Hippo signaling pathway coordinately regulates cell proliferation and apoptosis by inactivating Yorkie, the Drosophila Homolog of YAP. Cell. 122, 421-434. Huang, JM, Nagatomo, I, Suzuki, E, Mizuno, T, Kumagai, T, Berezov, A, Zhang, H, Karlan, B, Greene, MI, and Wang, Q (2013). YAP modifies cancer cell sensitivity to EGFR and survivin inhibitors and is negatively regulated by the non-receptor type protein tyrosine phosphatase 14. Oncogene. 32, 2220-2229. Kanai, F, Marignani, PA, Sarbassova, D, Yagi, R, Hall, RA, Donowitz, M, Hisaminato, A, Fujiwara, T, Ito, Y, and Cantley, LC (2000). TAZ: a novel transcriptional co-activator regulated by interactions with 14-3-3 and PDZ domain proteins. EMBO J. 19, 6778-6791. Kim, HT, and Kim, JW (2012). Compartmentalization of vertebrate optic neuroephithelium: external cues and transcription factors. Mol Cells. 33, 317-324. Kim, JY, Park, R, Lee, JH, Shin, J, Nickas, J, Kim, S, and Cho, SH (2016). Yap is essential for retinal progenitor cell cycle progression and RPE cell fate acquisition in the developing mouse eye. Dev Biol. 419, 336-347. Kim, NG, Koh, E, Chen, X, and Gumbiner, BM (2011). E-cadherin mediates contact inhibition of proliferation through Hippo signaling-pathway components. P Proc Natl Acad Sci USA. 108, 11930-11935. Lai, ZC, Wei, X, Shimizu, T, Ramos, E, Rohrbaugh, M, Nikolaidis, N, Ho, LL, and Li, Y (2005). Control of cell proliferation and apoptosis by mob as tumor suppressor, mats. Cell. 120, 675-685. Landau, K, and Yaşargil, GM (1993). Ocular fundus in neurofibromatosis type 2. Br J Ophthal. 77, 646-649. Lavado, A, He, Y, Paré, J, Neale, G, Olson, EN, Giovannini, M, and Cao, X (2013). Tumor suppressor Nf2 limits expansion of the neural progenitor pool by inhibiting Yap/Taz transcriptional coactivators. Development. 140, 3323-3334. Li, W, You, L, Cooper, J, Schiavon, G, Pepe-Caprio, A, Zhou, L, Ishii, R, Giovannini, M, Hanemann, CO, and Long, SB (2010). Merlin/NF2 suppresses tumorigenesis by inhibiting the E3 ubiquitin ligase CRL4(DCAF1) in the nucleus. Cell. 140, 477-490. Li, W, Cooper, J, Karajannis, MA, and Giancotti, FG (2012). Merlin: a tumour suppressor with functions at the cell cortex and in the nucleus. EMBO Rep. 13, 204-215. Li, Y, Zhou, H, Li, F, Chan, SW, Lin, Z, Wei, Z, Yang, Z, Guo, F, Lim, CJ, and Xing, W (2015). Angiomotin binding-induced activation of Merlin/NF2 in the Hippo pathway. Cell Res. 25, 801-817. Lian, I, Kim, J, Okazawa, H, Zhao, J, Zhao, B, Yu, J, Chinnaiyan, A, Israel, MA, Goldstein, LS, and Abujarour, R (2010). The role of YAP transcription coactivator in regulating stem cell self-renewal and differentiation. Genes Dev. 24, 1106-1118. Liu, H, Mohamed, O, Dufort, D, and Wallace, VA (2003). Characterization of Wnt signaling components and activation of the Wnt canonical pathway in the murine retina. Dev Dyn. 227, 323-334. Liu, H, Xu, S, Wang, Y, Mazerolle, C, Thurig, S, Coles, BLK, Ren, JC, Taketo, MM, van der Kooy, D, and Wallace, VA (2007). Ciliary margin transdifferentiation from neural retina is controlled by canonical Wnt signaling. Dev Biol. 308, 54-67. Liu, X, Yang, N, Figel, SA, Wilson, KE, Morrison, CD, Gelman, IH, and Zhang, J (2013). PTPN14 interacts with and negatively regulates the oncogenic function of YAP. Oncogene. 32, 1266-1273. Marcucci, F, Murcia-Belmonte, V, Coca, Y, Ferreiro-Galve, S, Wang, Q, Kuwajima, T, Khalid, S, Ross, ME, Herrera, E, and Mason, C (2016). The ciliary margin zone of the mammalian retina generates retinal ganglion cells. Cell Rep. 17, 3153-3164. McLaughlin, ME, Pepin, SM, Maccollin, M, Choopong, P, and Lessell, S (2007). Ocular pathologic findings of neurofibromatosis type 2. Arc Ophthal. 125, 389-394. Miesfeld, JB, Gestri, G, Clark, BS, Flinn, MA, Poole, RJ, Bader, JR, Besharse, JC, Wilson, SW, and Link, BA (2015). Yap and Taz regulate retinal pigment epithelial cell fate. Development. 142, 3021-3032. Mohseni, M, Sun, J, Lau, A, Curtis, S, Goldsmith, J, Fox, VL, Wei, C, Frazier, M, Samson, O, and Wong, KK (2014). A genetic screen identifies an LKB1-MARK signalling axis controlling the Hippo-YAP pathway. Nat Cell Biol. 16, 108-117. Mononen, TKK, and Tuppurainen, K (2007). Colobomatous microphthalmia and a cyst associated with a nonsense NF2 gene mutation. Am Genet Soc, f20750. Moon, KH, Kim, HT, Lee, D, Rao, MB, Levine, EM, Lim, DS, and Kim, JW (2018). Differential Expression of NF2 in Neuroepithelial Compartments Is Necessary for Mammalian Eye Development. Dev Cell. 44, 13-28 e13. Moroishi, T, Park, HW, Qin, B, Chen, Q, Meng, Z, Plouffe, SW, Taniguchi, K, Yu, FX, Karin, M, and Pan, D (2015). A YAP/TAZ-induced feedback mechanism regulates Hippo pathway homeostasis. Genes Dev. 29, 1271-1284. Napier, HRL, and Kidson, SH (2005). Proliferation and cell shape changes during ciliary body morphogenesis in the mouse. Dev Dyn. 233, 213-223. Ohgushi, M, Minaguchi, M, and Sasai, Y (2015). Rho-Signaling-Directed YAP/TAZ Activity Underlies the Long-Term Survival and Expansion of Human Embryonic Stem Cells. Cell Stem Cell. 17, 448-461. Ohta, K, Ito, A, and Tanaka, H (2008). Neuronal stem/progenitor cells in the vertebrate eye. Dev Growth Diff. 50, 253-259. Robinson, BS, Huang, J, Hong, Y, and Moberg, KH (2010). Crumbs regulates Salvador/Warts/Hippo signaling in Drosophila via the FERM-domain protein Expanded. Curr Biol. 20, 582-590. Schlegelmilch, K, Mohseni, M, Kirak, O, Pruszak, J, Rodriguez, JR, Zhou, D, Kreger, BT, Vasioukhin, V, Avruch, J, and Brummelkamp, TR (2011). Yap1 acts downstream of alpha-catenin to control epidermal proliferation. Cell. 144, 782-795. Serinagaoglu, Y, Pare, J, Giovannini, M, and Cao, X (2015). Nf2-Yap signaling controls the expansion of DRG progenitors and glia during DRG development. Dev Biol. 398, 97-109. Sivalingam, A, Augsburger, J, Perilongo, G, Zimmerman, R, and Barabas, G (1991). Combined hamartoma of the retina and retinal pigment epithelium in a patient with neurofibromatosis type 2. J Ped Ophthal Strabis. 28, 320-322. Song, JY, Park, R, Kim, JY, Hughes, L, Lu, L, Kim, S, Johnson, RL, and Cho, SH (2014). Dual function of Yap in the regulation of lens progenitor cells and cellular polarity. Dev Biol. 386, 281-290. St John, MA, Tao, W, Fei, X, Fukumoto, R, Carcangiu, ML, Brownstein, DG, Parlow, AF, McGrath, J, and Xu, T (1999). Mice deficient of Lats1 develop soft-tissue sarcomas, ovarian tumours and pituitary dysfunction. Nat Genet. 21, 182-186. Stanger, BZ (2008). Organ size determination and the limits of regulation. Cell Cycle. 7, 318-324. Sudol, M (1994). Yes-associated protein (YAP65) is a proline-rich phosphoprotein that binds to the SH3 domain of the Yes proto-oncogene product. Oncogene. 9, 2145-2152. Tapon, N, Harvey, KF, Bell, DW, Wahrer, DC, Schiripo, TA, Haber, D, and Hariharan, IK (2002). salvador Promotes both cell cycle exit and apoptosis in Drosophila and is mutated in human cancer cell lines. Cell. 110, 467-478. Tropepe, V, Coles, BL, Chiasson, BJ, Horsford, DJ, Elia, AJ, McInnes, RR, and van der Kooy, D (2000). Retinal stem cells in the adult mammalian eye. Science. 287, 2032-2036. Udan, RS, Kango-Singh, M, Nolo, R, Tao, C, and Halder, G (2003). Hippo promotes proliferation arrest and apoptosis in the Salvador/Warts pathway. Nat Cell Biol. 5, 914-920. Verghese, S, Waghmare, I, Kwon, H, Hanes, K, and Kango-Singh, M (2012). Scribble acts in the Drosophila fat-hippo pathway to regulate warts activity. PLoS ONE. 7, e47173. Wang, Y, Dakubo, GD, Thurig, S, Mazerolle, CJ, and Wallace, VA (2005). Retinal ganglion cell-derived sonic hedgehog locally controls proliferation and the timing of RGC development in the embryonic mouse retina. Development. 132, 5103-5113. Westenskow, P, Piccolo, S, and Fuhrmann, S (2009). Beta-catenin controls differentiation of the retinal pigment epithelium in the mouse optic cup by regulating Mitf and Otx2 expression. Development. 136, 2505-2510. Wiley, LA, Dattilo, LK, Kang, KB, Giovannini, M, and Beebe, DC (2010). The Tumor Suppressor Merlin Is Required for Cell Cycle Exit, Terminal Differentiation, and Cell Polarity in the Developing Murine Lens. Invest Ophthal Vis Sci. 51, 3611-3618. Wu, S, Huang, J, Dong, J, and Pan, D (2003). hippo encodes a Ste-20 family protein kinase that restricts cell proliferation and promotes apoptosis in conjunction with salvador and warts. Cell. 114, 445-456. Yu, FX, and Guan, KL (2013). The Hippo pathway: regulators and regulations. Genes Dev. 27, 355-371. Yue, T, Tian, A, and Jiang, J (2012). The cell adhesion molecule echinoid functions as a tumor suppressor and upstream regulator of the Hippo signaling pathway. Dev Cell. 22, 255-267. Zhang, N, Bai, H, David, KK, Dong, J, Zheng, Y, Cai, J, Giovannini, M, Liu, P, Anders, RA, and Pan, D (2010). The Merlin/NF2 tumor suppressor functions through the YAP oncoprotein to regulate tissue homeostasis in mammals. Dev Cell. 19, 27-38. Zhang, H, Deo, M, Thompson, RC, Uhler, MD, and Turner, DL (2012). Negative regulation of Yap during neuronal differentiation. Dev Biol. 361, 103-115. Zhao, S, Chen, Q, Hung, FC, and Overbeek, PA (2002). BMP signaling is required for development of the ciliary body. Development. 129, 4435-4442. Zhou, Y, Tanzie, C, Yan, Z, Chen, S, Duncan, M, Gaudenz, K, Li, H, Seidel, C, Lewis, B, and Moran, A (2013). Notch2 regulates BMP signaling and epithelial morphogenesis in the ciliary body of the mouse eye. Proc Natl Acad Sci USA. 110, 8966-8971.